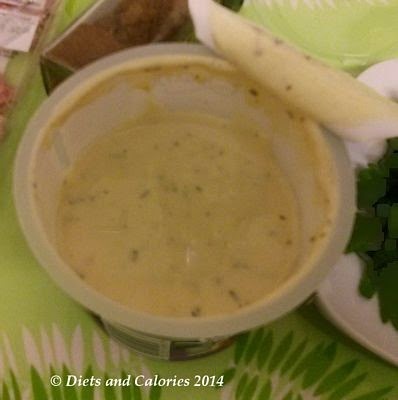 This is my third review of Quark based cooking sauces. 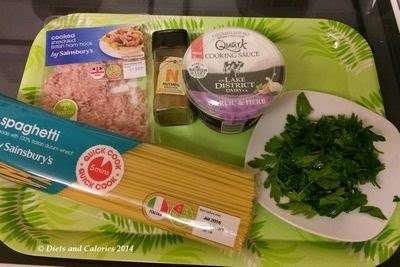 This time it’s for the Garlic & Herb variety which was used to create a take on Spaghetti Carbonara, called Quarkonara! 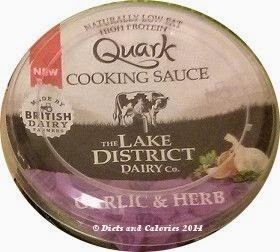 Because they’re made from Quark, The Lake District Dairy Co.’s cooking sauces are naturally low in fat and calories and high in protein. They work well with pasta, chicken, vegetable and prawn dishes, and can be eaten cold as a dip. Varieties in the range so far include: Garlic & Herb, Tikka and Tomato & Basil. Cooked as instructed, this recipe has 344 calories per serving, and 90% less saturated fat when using The Lake District Dairy Garlic & Herb cooking sauce instead of full fat cream cheese. As with the gnocchi dish made with the Tomato and Basil Quark sauce, this dish took just 20 minutes to prepare. Drain spaghetti and reserve 100ml of cooking water. Empty cooking sauce into the pan and gently heat until piping hot. 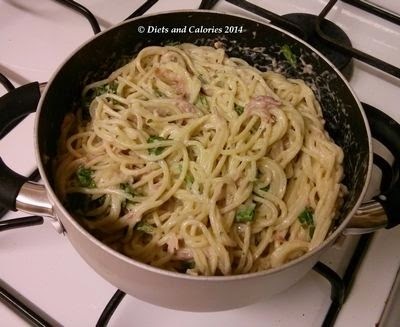 Add spaghetti, ham, parsley, nutmeg and 60ml of cooking water. Toss until mixed. Add more water if necessary. Divide between warmed plates and serve garnished with more parsley. I didn’t partake in this meal as I don’t like spaghetti. However, the rest of my family all gave it a try. As I was dishing it up between four plates, I thought it was just really stodgy. I probably should have added more water to loosen it up a bit. I didn’t cook any extra vegetables this time, but instead added a drained can of reduced sugar and salt sweetcorn. I would have added peas as well, but one of my kids won’t eat peas, and I wasn’t about to start picking peas out of this meal. I did have a taste, and to be completely honest, wasn’t too keen. To me, it didn’t taste anything like a carbonara taste I was expecting. This is the same verdict as my youngest daughter, who loves carbonara. My middle daughter enjoyed it and finished the lot. The garlic is quite strong in this sauce and I think I’d prefer it in another type of dish, maybe mixed with cooked chicken and mushrooms perhaps. I guess it’s all down to a matter of personal taste. My husband really liked it, as he has done with all the sauces, but also felt the spaghetti was quite stodgy. Personally, I prefer eating a vegetable based meal with a side serving of the protein and a tiny bit of carbohydrate, so these carb based meals will never appeal to me. Out of the three sauces, my favourite was the Tomato and Herb and the Tikka. The Lake District’s new Quark based cooking sauces are sold in 200g pots and can be found in the chilled cabinet section of the supermarket – where the cream cheese and other Quark products are. Nutrition information per 100ml: 76 calories, 6.1g protein, 7.2g carbs, 5.6g sugars, 2.5g fat, 0.4g saturates, 0.5g fibre, 0.74g salt. Ingredients: Quark (from milk) (55%), water, caramelized garlic and herb paste (15%) (water, flavourings (contains milk), sugar, herbs (parsley, chives), sunflower oil, garlic, salt, lemon juice concentrate, onion powder, yeast extract, spices (pepper, turmeric), brown sugar, stabilizer (pectin), cornflour. Other information: Suitable for vegetarians. Do not freeze. Use with 3 days of opening. Made by British Dairy Farmers. The Lake District Dairy Co. supplied me with the sauces and ingredients to try out and review. Please note that I have not been paid for my review and all opinions are my own.